You might be wondering how do you call a .Net DLL from a VB Script, well look no further as I will explain to you steps by step how do you achieve on doing this. You might be wondering why do you want to do this? Why not just do everything on .Net or VBScript? Well there might be some instances this will be useful, like modifying a start-up script for GPO which is already in VBScript but you want to extend it safely (compiled codes) or just reusing available DLL’s that are out there in your organization saving you time to redevelop the same thing again. There are a lot of reasons that you want to do this but this is why I am doing it, unless someone else suggest of a better way of doing it anyways I am writing this so that if anyone needed this reference its just here. Ok lets start with what you need. Definitely you need to develop or use a existing DLL, for this example we will develop from scratch, you also need the VBScript that you want to edit or create and that’s it. Step 1: Your DLL. Fire up Visual Studio you can develop either in C#, VB or any language you want, this sample will be C#. You need to create a Class Library Project. On the code above applying the ComVisibleAttribute Class controls accessibility of an individual managed type or member, or of all types within an assembly, to COM. You can apply this attribute to classes, structures, interfaces, delegates, enumerations, fields, methods, assemblies or properties. By default it is set to true but for in case you want to hide the individual type you can just set it to false (I just showed it for reference purposes, as you notice the getValue2 does not that attribute but still is still visible). unregisters it. Now what that the /codebase option stand for? 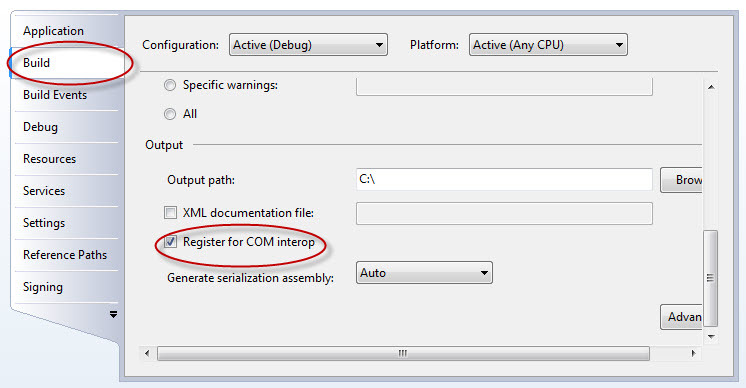 You need to use the /codebase switch when you don’t have your assembly in GAC because that will add absolute path for your assembly in registry so that COM client can find it. Now you have your DLL ready. Now run your VBScript and that’s it. You have to run your script on 32 bit command line. Click start, click run then type %windir%\SysWoW64\cmd.exe and enter. Command line should be opened in SysWoW64. am encountering difficulties with your RSS. I don’t know why I am unable to join it. Is there anybody getting the same RSS problems? Anyone who knows the answer will you kindly respond? Thanks! !